Who doesn't love a gift with purchase? Well you'll be happy to hear that Harrods have teamed up with Estée Lauder and are offering an exclusive GWP worth over £155, that contains a selection of skincare and makeup. There really isn't a better time to splurge, or stock up! To qualify for this free beauty gift you simply have to spend £75 or more on Estée Lauder products online at Harrods and the gift will automatically be added to your basket. This offer is valid from Thursday 11th February 2016 until Sunday 6th March 2016. The gift features a range of the brands beauty must-haves, including a full sized Pure Color Lipstick worth £22.00 in the colour 'Scarlet Siren' a bold, luxuriously rich red lipstick. Not only do you receive a selection of products, you also receive a lovely light grey croc effect clutch and makeup bag, that's perfect for travel. You can shop Estée Lauder online at Harrods here. 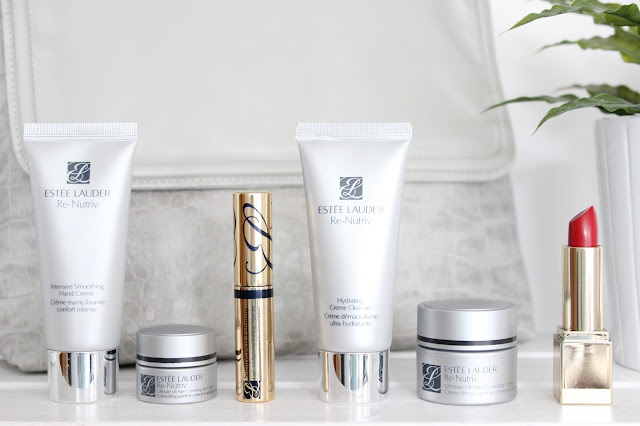 Wouldn't this gift with purchase from Estée Lauder make the perfect Mother's Day treat?